I haven't shared this with very many people unless you've been reading the Sewing As A Business Forum on Patternreview, but I'm going to start teaching people how to sew. My friend, Stephanie, the one I went to New York and Italy with, and I will be developing a business plan to open a sewing studio. But neither one of us can wait until we have the studio open. We've decided to start teaching at the City Parks and Recreation. Stephanie used to work in the Rec department while going to college and has kept in touch with the people who work there. After getting some advice from our Fashion Design college professor, we went straight to the City and got ourselves signed up to teach three classes in January. The classes will run for four weeks for three hours each session and be open to ages 10 through adult. The classes we will be teaching includes a basic beginner class where we will teach students how to sew a tote bag and an apron. We will be teaching this class on both an afternoon and a Saturday once a week. Then the next month, we will teach an advanced beginner class with some PJ pants and a collarless robe as the projects and another beginning sewing class. Then, after the Saturday class we will hold a two-hour sewing workshop where people can come in and work on their own projects while we hold their hand or help them with fitting. The goal is to fine tune our teaching techniques and learn what people want to learn how to do. That way when our studio is open, we will be able to target our classes around the needs of our customers. We will also be building a client base and hopefully, a following. Hopefully we can save all the money we earn while teaching for the City to help open up a real studio of our own. I spent today making a sample of the tote bag we will be teaching. I think this one should be on display at the teen center instead of the senior center, although some of those seniors probably remember the 70's quite fondly. I know I do. It's just your standard bag cut on the fold and the sides stitched up. Then the corners are stitched across to form a box bottom. The bag measures 13 X 13 X 6 which is a good size for shopping. It wasn't too big to maneuver under the pressure foot either. I finished the side seams with a french seam since I didn't want people to be disappointed with the zigzag finish. Also, it gives the bag more of a quality feel to it. I had the fabric already in the stash, of course. You can't tell much, but both the red and the yellow fabrics have lurex threads in them and have quite a bit of shine. I wanted to embellish the pockets so that people can see what they can do after they learn the basics. We won't be teaching these embellishment techniques, but if they want us to, we will see about teaching embellishment techniques at a later date. I have a lot to be thankful for. I have a husband who loves me and respects the things I want to do. I have a child with a disability who has overcome any problems the disability caused and is a happy child who loves his parents. My mom has been gone from us for three years now, but I'm so proud of my dad and all he's done with his life since losing his wife of 53 years and am thankful I still have him. My twin sis has left her self-destructive husband and is thankfully living happily nearby. I'm thankful for my older sister, her son and his family too. I love them all so much. Notice it's the people in my life I'm thankful for. This includes you, my sewing friends. For you I am thankful. My blog started out as a sewing blog, and for the most part, I've kept it strictly to sewing. However, now I need to take a slight tangent at times. I toyed with the idea of starting another blog to journal my weight loss. I would have done it too, except the idea of setting up another blog just seemed too daunting. Also, I already have you my friends ready to cheer me on as I do my best to become a stronger, yet smaller, woman. I hope you'll indulge me these tangents on weight loss. But don't worry, I will still blog about all the new pattern alterations I'll be doing to fit the new stronger, smaller me. As of this morning, I've lost 15 pounds. You'll see that I haven't updated my ticker yet because my official weigh-in is on Mondays. That's more weight gone in five weeks than I've ever been able to lose on Weight Watchers in twice that time and I've done WW several times in my life. The best part is I'm not hungry or craving sweets and carbs. Yesterday was Thanksgiving and I can't believe how easy low-carb was. I ate till I was full on very low-carb salad, green beans, and broccoli with a tiny spoonful of corn and was very satisfied. I had bought meatless chicken drumsticks but forgot to cook them. While everyone else was eating pie, I ate my almonds and diet swiss miss cocoa for dessert. I did have one little cherry from the pie, but found it way too sweet. It feels good not to have any regrets. I enjoyed my entire family so much yesterday, that the food was only a small part of the day. And yes, I was the cook except for the turkey which my dad cooked. I had to have everyone else taste the gravy and dressing for seasonings. That was fun getting other people into the kitchen with me. I hope you all had an equally enjoyable day. My next blog entry will be about sewing, I promise! My mojo is back! I guess all I had to do was whine to you all. After looking at the patterns again, I decided to buckle down and get some sewing done. I just moved my cutting mat to the kitchen table and got to work. 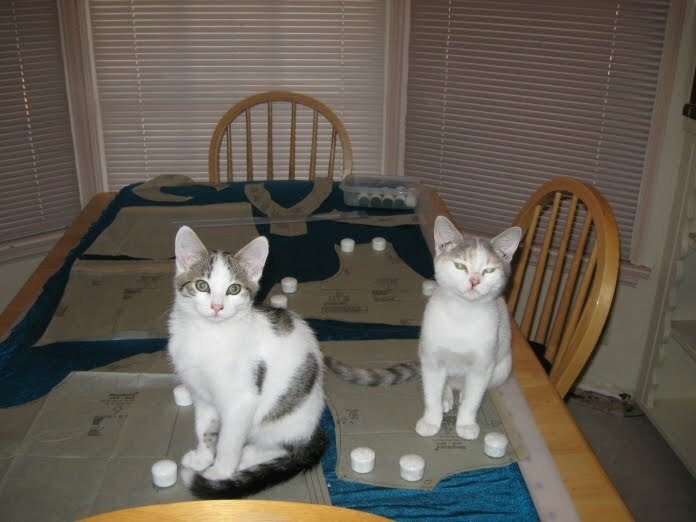 I had some extra help with holding down the pattern pieces. Chrissy is on the left and Becky is on the right. They are about two months old and such curious devils. We are really enjoying having babies in the house. It's been about 30 years since I've had a kitten. I decided to do a quick knit muslin of Simplicity 2619. 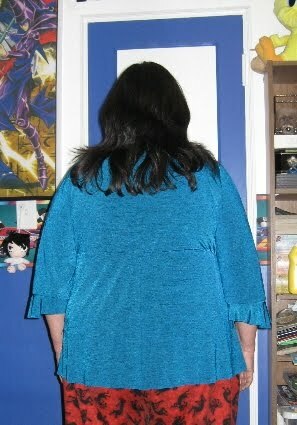 I used a shiny poly/lycra knit that I would never wear out of the house, even though I love the color. It was also hard to photograph. I finally found the right camera settings so that there wasn't weird color shifts where the fabric shined. First off, it's way too low for my taste. I'll have to raise it at the center front two inches so that I can wear it to work. I had added a big belly alteration that needs to be removed. You can see I have it pinned out in the photo. It also needs some more length at center front on the bodice. I have it tugged down for the camera. I should have tugged the sides down. The elastic I put in the bodice seam is just a tad too tight. My fake FBA worked, but since it left the center front too short, I'll add about half the FBA length to the CF. The armhole is also too big. I think that's why I have the fold over the bust. I've pinned in a sloping shoulder adjustment, but I don't think that's the right alteration. It's is pulling at the shoulder slightly with this change. It's not a very big bust fold so I don't think I'll need to rotate the excess into the bust gathers. I think I'll first just shorten the armhole and see how that goes. From the side you can see that it doesn't give me the maternity top look and that makes me happy. The sleeves do need to be narrowed toward the hem and I think I'll loose the flounce. I added a wedge to go over my full hips and I think that alteration works great on the back. Since I'm so short waisted, I shorted the pattern at the waist by two inches. It looks like I may need to add that back to the hem since this muslin isn't hemmed yet and I feel it could be a bit longer. I'm also debating weather I want to put the facing on the outside like the pattern has you do. I know it's just a design feature to give it that duro look. I believe that the duro look is over. I'm thinking some nice decorative buttons down center front would look much better. What do you think? Is this a style I should even be trying? Is it too young? Too maternity? All wrong for a short fat girl? How about a leopard print? Or should I keep it to a solid color? I guess my mojo isn't quite back yet because I don't usually question myself like this. I don't know what's wrong with me. I haven't been motivated to sit down and sew lately. I think about sewing, I buy sewing stuff like patterns and trims. I'm just not sewing. Ever since I had my Nephew and his family stay with me for two weeks, I haven't been able to get going again. Maybe it's the fact that my cutting table is covered with stuff I need to put away. Maybe it's that I'm working out how to make low-carb a part of the rest of my life. Maybe it's that I want so badly not to be this size any longer. Maybe it's that my sewing room is feeling cramped with stuff that I don't know what to do with. Maybe it's all these things and more. 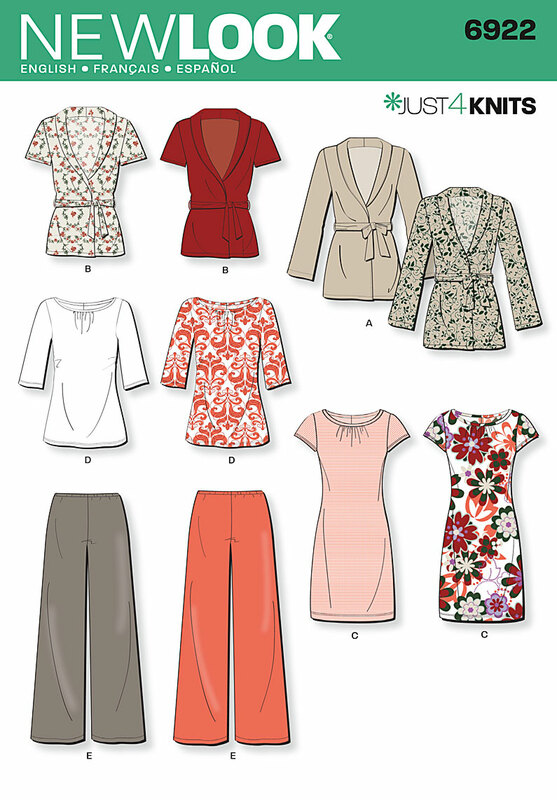 Here are some new patterns I just bought and plan to sew just as soon as my mojo returns. Some of the images are quite large so you will need to click on them to see the whole image. 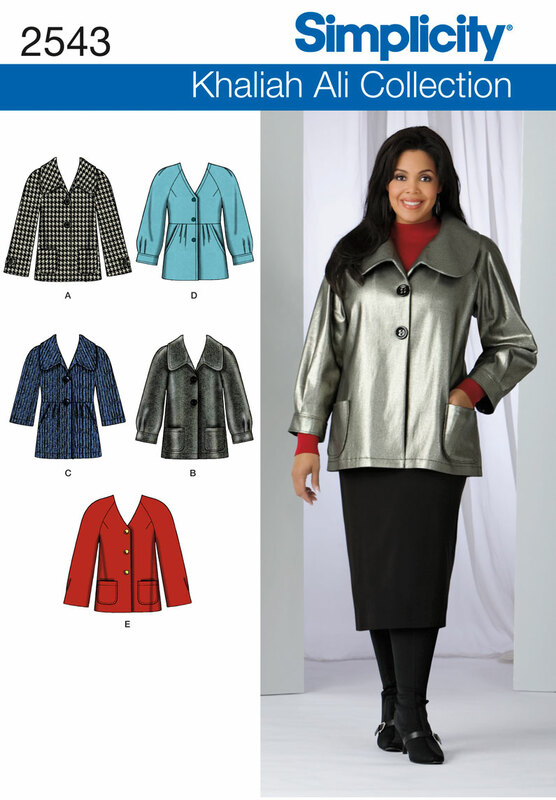 This is Simplicity 2619. I don't think this one will look very good on me. But it's a style I really like. I tried to make this style once before and I don't think it looked very good and it wasn't very comfortable. 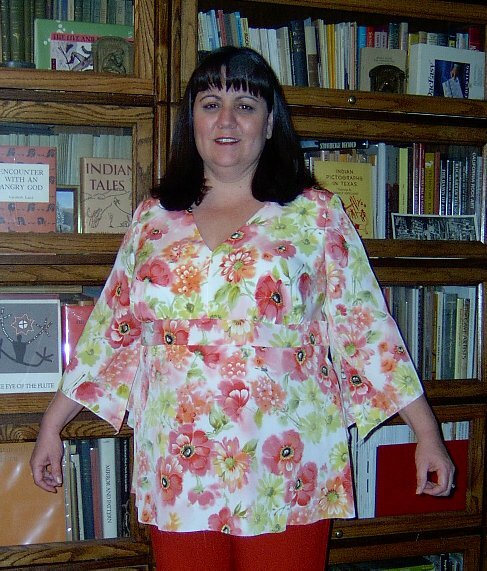 I got a lot of compliments on the review of this blouse, but I never did finish it and I think I just threw it away or donated it. I think I'll try the style again in a knit with the new pattern. Maybe it was the band under the bust I didn't like. I guess I'll have to do a muslin to know for sure. I like View A and View C. I don't know how well those pockets and pleats will look over my big belly and the collar would have to be downsized. I have some black and white houndstooth that would look good in this pattern so I may get to this one before the end of the year. It's just that the last jacket I made took three muslins and a lot of time. However, the jacket was really worth it in the end. I love this little jacket. I also like that it has a princess seam over the bust which is quite flattering on me. I have some really nice printed stretch moleskin that would be perfect for this pattern. The moleskin has a slick back side that would mean I wouldn't need a lining. This one could be doable in the next few weeks. I also really like the darted shell. I don't have a woven pattern for a shell. I just love the cardigan with the collar. It looks like a shawl collar but it isn't. It has a sewn collar attached with a facing. I'm not sure how that would work in real life, but I like it in theory. I'm still pondering this one. You know I have a fondness for twin sweater sets and this could be my next one. People will probably start to talk if I make one more from my other two patterns. I hope you noticed my little runner at the top of my blog. Feel free to encourage me to keep at it. I think I'm doing really great. It's been just over three weeks and I'm down 10 pounds already. I'm expecting another big loss this week. I haven't even been tempted to cheat. Not having my blood sugar plummet has been reward enough. That and finally getting enough sleep. If I were going to cheat, it would have been today. My co-workers brought in a chips, lasagna, and a cake since one of them are retiring. I just ignored it all and ate my fake chicken and vegetables with Alfredo sauce. Yum! I'm still alive, in case you were wondering. I've just been preoccupied with life. Really, lots of things have been going on, except no sewing. I think I did so much sewing over the summer that I don't have a need to sew at the moment. That doesn't mean I don't want to sew because I do. In fact, I think I'll sew up a top today that I cut out last spring. 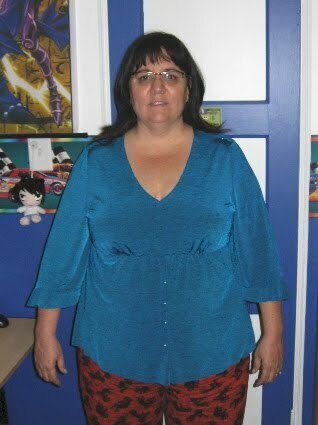 It's a pattern that I designed using my TNT t-shirt pattern and copying this Coldwater Creek top. I hope I can remember how I planned to sew it together. My sewing room is a mess so I'm going to have to clean up first. Since I didn't get any work today and there is a holiday tomorrow, I'm sure I can get it done. Another thing that has me preoccupied of late is my weight. Remember this post last January about weight loss? Last January I had decided that it was time to finally lose the weight. So what happened? I gained 10 pounds this year. I've been doing some real soul searching and decided that low calorie, low fat diets don't work for me. I've been on them off and on for years and years. And I've been getting fatter and fatter because of it. After running into a friend at an ASG meeting and seeing how much weight she has lost, I decided to try something new. The Metabolism Miracle is a book by Diane Kress that extols the virtues of a low carb diet. As a vegetarian I have always shunned these types of diets including Atkins and The South Beach diet. However, this author makes some very valid points about excluding carbs from my diet. The most important being that my body doesn't process sugar well any longer. I'm hypoglycemic which causes me to eat way too often and always high carb foods that cause me to crave more high carb foods. This is a pre-diabetic symptom and that's a place I really don't want to go. Since I started following the Metabolism Miracle eating plan, the hypoglycemia has totally gone away and more importantly, I'm sleeping again. I haven't had more than five hours of sleep in about five years. After the first three days on this eating plan, I can hardly stay awake after 10 p.m. and I am getting 8 hours of sleep regularly. I'm even dreaming again! What a difference getting a full nights sleep makes in my attitude toward life. I also lost 10 pounds in first two weeks. Who knew that was possible? OK, I'm sure it was all water, but still, it feels great not to be all bloated and puffy. Because I don't eat dead animals (nor live ones!) I am depending upon soy, wheat protein, and lots of Morningstar Farms and Boca products for my protein source. I'm having to learn how to cook all over again like I did when I stopped eating meat. For now I'm not eating potatoes, rice, legumes, breads of any kind, and all fruit. Some of these high carb foods will be reintroduced back into my meal plans later, after my body gets used to not being flooded with all the sugar they introduce into my body. This meal plan puts the body into ketosis, which according to research, is what burns body fat. And I'm all about burning the body fat at the moment. As I lose weight, I'm going to be facing a new challenge. Altering my patterns to fit the new smaller, fitter body that I'm expecting. That's a challenge I'm looking forward to.